The British tank doctrine split tanks into Light Tanks, used for reconnaissance, Cruiser tanks, fast and well armed, meant to act as the cavalry of old, and Infantry tanks, slow and heavy, meant to support the infantry. The A11 Infantry Tank Mk.I and A12 Matilda belonged to the latter category. 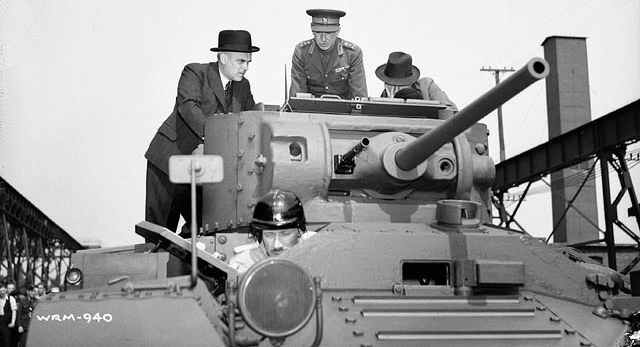 The development of another Infantry tank, which would become known as the Valentine, started without a specification from the War Office (hence the absence of an army designation), as a private design by Sir John Carden, and was submitted on February, 10, 1938, to the authorities. By then, the Matilda had been chosen for production, but the Valentine was something different. Vickers engineers basically tried to enhance their A10 Cruiser II tank design, with a dramatic increase in protection (up to 60 mm/2.36 in). This choice allowed the use most components and parts of the already produced Cruiser I and II, therefore creating an efficient and cheap solution to the need of new infantry tank models. By then, the Matilda was found to be far costlier than the Infantry Tank Mk.I, and not suitable for mass-production. Comparatively, the Valentine seemed a good compromise. The name itself still is a mystery. It could have originated either from Sir John Carden’s middle name, or the date of its first submission (St. Valentine day), or a composed Vickers factory codename. However, most historians agree that Valentine was just a simple codename used during development. 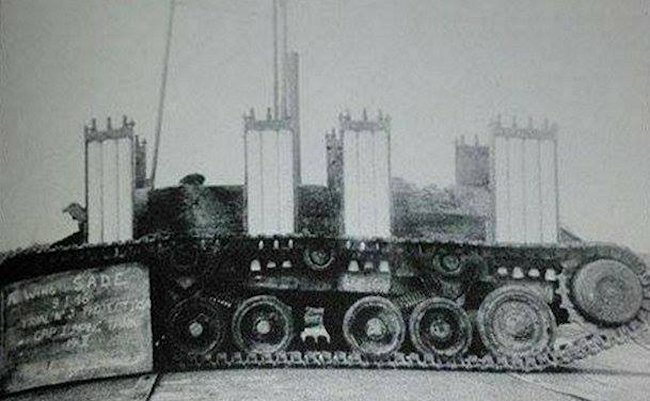 Basically, the Valentine’s lower part was almost identical to the A9-A10 Cruiser tank designs. The engine was also the same, as well as the transmission, drivetrain, steering, tracks, and roadwheels, but the upper hull was lowered, and the specially designed turret was more compact and also lowered. This resulted in a compact, if somewhat cramped design, easier to protect. And its armor was massive, although 20 mm (0.79 in) less than the Matilda, but similar to that of the Infantry Tank Mk.I (A11), and much superior to the best German tanks of the time, the Panzer III and IV. The armament was the same puny QF 2-pdr Mk.III(40 mm/1.57 in ), already shared by virtually all British armor. The War Office was concerned by the small size of the turret, which only allowed two men to operate in it. They would have preferred a three-man turret to allow the commander to be fully cleared of other tasks. But, by 1939, war was looming on the backstage of European affairs, and the design was finally approved in a stroke in April, in exchange for a fast delivery schedule. Vickers prepared itself for an order, which came at the end of 1939 with absolute priority, asking for the first deliveries in May 1940. However, by the deadline, the first -and only- prototype was barely on trials. Meanwhile, the evacuation of Dunkirk left Great Britain devoid of any heavy equipment. Mass production started without a pilot or pre-production series, under the denomination of Tank, Infantry, Mark III. The general layout was straightforward, with a clear compartmentalization in three sections, the driver, fighting and engine compartments. The transmission was short, directly connected to the drive sprockets at the rear, keeping the hull as low as possible. The driver was located at the front center, along with all the steering levers and clutches, which acted on control rods running through the entire length of the hull to the rear gearbox. The driver had good peripheral vision through a direct vision port and two periscopes. Access was possible through two hatches (one per side), and a small escape hatch behind his seat. The early two-man turret had a cylindrical shape, made of rolled plates, with a squared bulkhead protecting the mantlet at the front and a short rear basket. The gun was positioned just between the gunner (left) and the commander (right), whom also loaded it. When the new turret was introduced with the Mark III, the commander was relocated further back. The manufacturers included the original Vickers-Armstrong factory, Birmingham Railway Carriage & Wagon Co, Metropolitan-Cammell (in three plants), and Canadian Pacific Railway (Angus Shops, Montréal) for Canada. The Mark I set the tone for the entire series of eleven main variants, with many sub-variants, and a staggering total of 8300 units. The main armament and turret design, as well as the engine and protection, were continuously improved while keeping roughly the same general appearance until 1945. The Mk.I was recognizable by its original two-man turret and 2-pdr (40 mm/1.575 in) gun. From the start, a coaxial Besa machine-gun constituted the secondary armament. The crew was formed of only three men due to the cramped interior, and the commander was also busy acting as gun loader, machine-gunner and radio operator. The production was rushed to such a point that many problems were later detected and fixed with the next Mk.II. The main engine was the AEG A189 petrol delivering only 135 hp, and the hull was riveted. 350 were delivered in all, most seeing action in Libya, while others stayed at home for training. A Valentine Mk.II with simple side skirts mounted. This version appeared in 1941 and twice as many were completed (700 in all). By June, the “Valentine” designation was officialized. This version had a 6-cylinder AEC A190 diesel delivering 131 hp, but at a lower rpm and with more torque. The autonomy was raised dramatically by adding a left-side external tank (one at the rear was more common practice). This became a trademark of the Valentine. The Valentine III appeared in late 1941 and was one of the most produced versions of the entire series. The great improvement came with a completely redesigned turret, with a new internal mantlet and an enlarged turret basket, giving the much needed extra room to accommodate a loader to operate the gun, freeing the commander for other tasks. As a compensation for the added weight, the side armor was somewhat downgraded from 60 to 50 mm (2.36-1.97 in). The main gun was now a QF 2 pounder Mk.V. 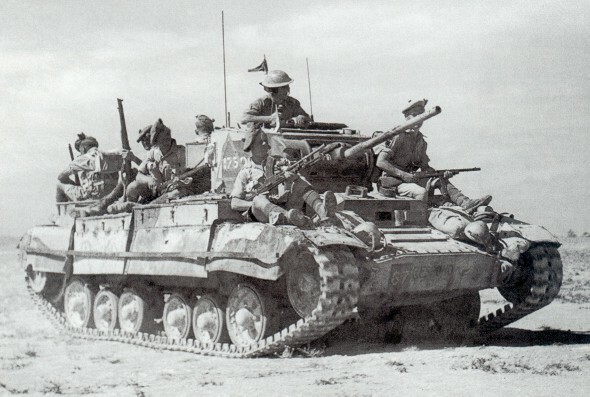 A Valentine Mk.III in the Libyan desert, carrying Scottish infantry on its way to the front. Notice the worn-out side skirts. The shortage of British-built engines led to the adoption of US-built GMC (General Motors) engines instead for the Valentine. The Mark IV was based on the Mark II, but was equipped with a 138 hp GMC 6004 diesel coupled with an American transmission. Reliability, fewer vibrations and less noise were the results of these process, which were precious in North Africa, although it also meant a smaller range. The Mark V produced in 1942 was virtually identical to the Mark III, but equipped with the same GMC diesel and transmission. Both these versions were derived from the Mark IV and were two-man turret models, but with many modifications. The production line was set up in 1941 and entered full swing in 1942. These vehicles had more US and Canadian built parts, and the Besa coaxial MG was replaced by a Browning cal.303 (after the 15th delivered). The nose glacis was modified during the production. It was cast rather than assembled in parts, as well as many other parts of the hull and turret. They also shared some components with the Ram. The Mark VII introduced a new N°19 radio set and some internal modifications. The Mark VIA appeared in late 1942 with wider, new studded tracks, jettisonable fuel tanks, an oil cooler and protected headlights. In all, 1420 Canadian Valentines were produced, but they were never really incorporated into active Canadian Armoured Divisions, most being retained in Great Britain and at home for training. Since the 2-pounder was found inadequate against the main German tanks of 1942, Vickers engineers worked frantically on a way to adapt the much more massive, long-barrel 6-pounder (57 mm/2.24 in) into the cramped Mark III turret. They succeeded, but at the expense of the coaxial Besa machine-gun. The Mark VIII received the British AEC A190 diesel, but the Mark IX, an upgunned Mark V, retained the US-built GMC 6004 diesel, which was upgraded towards the end of the production in 1942, now giving 160 hp. Both had somewhat downgraded armor. The Mark X was virtually identical to the IX, but at the start incorporated the new GMC diesel, a redesigned turret which reintroduced the coaxial machine-gun, and it used welded construction and some cast parts. In 1944, when this model, only produced in small numbers, appeared, they were only given to unit commanders. The Mk.XI had the Mark III three-man turret, and received the long-barrel ROQF 75 mm (2.95 in) gun, basically a 6-pounder (57 mm/2.24 in) rebored to 75 mm (2.95 in). It was also equipped with the latest and most powerful version of the US GMC engine, now giving 210 hp. It had an all-welded construction with many cast parts, including the Canadian design hull nose. The Valentine never earned a particular surname, perhaps because it was so commonly seen by troopers. At the same time, the Infantry Tank Mk.III cumulated some of the usual shortcomings of British tanks, like a cramped turret and interior with small hatches and a partly riveted hull. Most of all, it had the mainstream 2-pounder QF (40 mm/1.57 in) gun, which lacked penetrating power as well as explosive force and concussion (HE shots), despite a good initial velocity. But, at the same time, it was dependable, sturdy, well protected, relatively easy to maintain and, most of all, had a low silhouette, especially compared to the Sherman. They were hard to hit and easy to conceal with a little cover, in any sizable depression in the ground. They showed exceptional endurance. Some Mk.Is and IIs from the VIIIth RTR had roamed 3000 miles of desert before reaching Tunisia in 1943. They were found capable of running 500 miles without maintenance. The Valentine was first called to action in Libya, when the 8th RTR of the 1st Royal Army took Capuzzo, on 22 November 1941, part of Operation Crusader. Most of the eleven marks saw their baptism of fire in the wide expanses of the desert, until the end of the Tunisian campaign. In January 1942, they were found instrumental in support of the 2nd South African Division, in the taking of Bardia. Some (from the 7th RTR) were also trapped in Tobruk and actively took part in the defense of the city. Those of the 23rd Armored Brigade took part in the first battle of El Alamein. At the second battle of El Alamein, the few front-line Valentines were upgunned versions (Mark VII). However, in Sicily and Italy, they arrived in growing numbers. Despite this, the QF 2-pdr stayed the norm for most of the conflict, and, because of this, they were gradually phased out for secondary duties, or were converted for other tasks. Some were stationed in Gibraltar, Madagascar, Malta. In total, the 6th, 8th and 11th Armoured Divisions, as well as the 1st Polish division (trained in Scotland and deployed in Italy 1944-45), were mostly equipped with the Valentine. In a general way, they kept their original assignment as close support infantry tanks and were seen carrying men to the frontline as improvised APCs. In France, in June 1944, half the Valentines in service were 6-pdr versions, which were found more suitable for frontline action. However, their armor was no match for most of the German tanks of the day. The type was obsolescent by now, and they were definitively withdrawn to second line duties, stationed at the rearguard, sent back to Great Britain for training (like most of the Canadian-built models) or abroad (to serve with ANZAC troops). New Zealand received 255 Mk II, III and V Valentines, of which the New Zealand 3rd Division used 34 in their 1944 Pacific campaign. They modified 9 Mk III to the MK IIICS (Close Support) standard by replacing the standard 2 pdr gun with 3 inch (76.2 mm) howitzers from surplus Matilda Mk IV CS versions, and were instrumental in the Pacific Campaign until the end of the war. Other users of the Valentine included the Australians (mostly in North Africa), the Poles, and the Free French (a few) in Tunisia and Italy. Six Valentines from B Special Service Squadron, RAC, also took part in the attack on Diego Suarez on Madagascar (5-7 May 1942). One squadron was posted to Gibraltar. Not well known is their service in Burma: The 145 RAC (9th Battalion the Duke of Wellington’s Regiment) received their Valentines by October 1942 and others with three-man turrets in February 1943. This was the only regiment using this tank in Burma. Valentines from C Squadron took part in an amphibious assault on Donbiak in the Arakan. Three tanks were lost in hidden ditch (rediscovered in 1945). They proved to be immune to Japanese anti-tank fire but the assault failed nevertheless. No Valentines were committed for the second Arakan offensive in 1944. 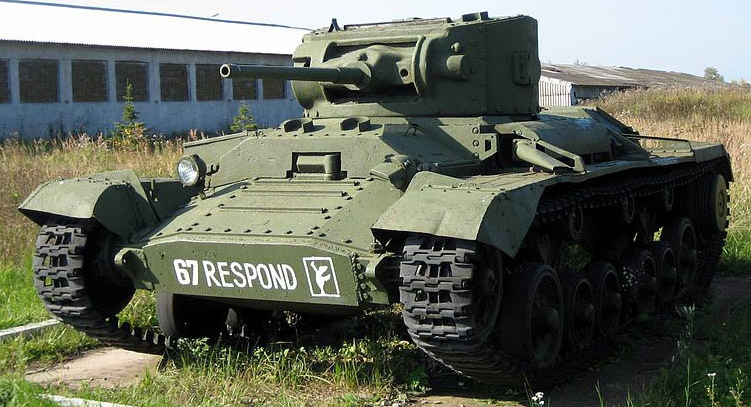 The 25th Dragoons briefly used Valentines during a second spell in India, but converted to the Sherman late in 1944. A total of 2690 British Valentines were sent to Russia (some Canadian-built), and 400 were lost (sunk) en route to the Northern and Southern front via the Murmansk line, or the Caucasus line, through Iran and the Persian gulf. The Russians Designated as the “British Mk.III”. The Valentine was one of the preferred “mounts” of the Soviet tank crews. They appreciated the low silhouette, reliability and protection, but found the narrow tracks and wheeltrain was not very well suited to heavy snow, which clogged behind or packed the wheels. A problem shared with the Matilda. The gun, like the Matilda’s, not liked. Seen as too weak when facing armor and infantry as it lacked a HE (High-Explosive) shell. There was a plan to upgun the Valentine in the same way as the attempted 76mm armed Matilda, but the Valentine’s turret was much to small. As such, Vasiliy Grabin’s bureau was tasked with developing a suitable mount to equip the Valentine with the Soviet’s own 45mm 20-K Tank Gun, the same gun found on the BT Seriess of light tanks. This didnt get far as the gun did not provide any greater performance than the original 2-Pounder. The Soviets were extremly happy when the British started sending them the 6-Pounder (57mm) armed Valentine Mk. IXs. They were gradually phased out of the frontline and delegated to subsidiary duties in 1943-44. Valentine Mk.V DD, with folded canvas. 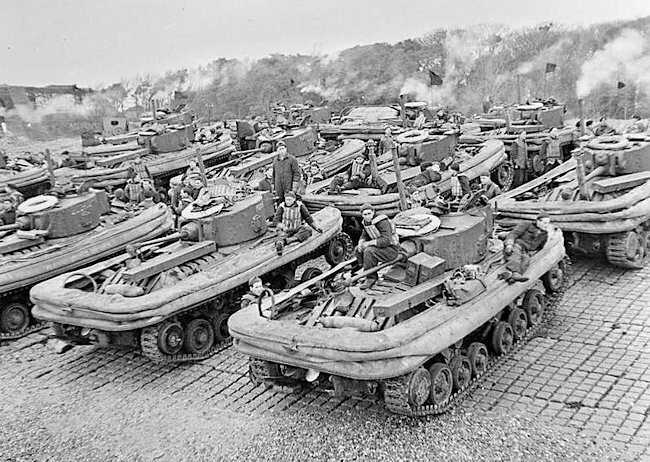 For “Duplex Drive” (kits invented by Nicholas Straussler), one of the famous so-called “Hobart’s funnies” amphibious tanks intended for D-Day. 625 to 635 were converted in 1943-44 by the Metropolitan-Cammell Carriage & Wagon Works Co. Ltd, but they mostly served to train crews for the Sherman DDs. 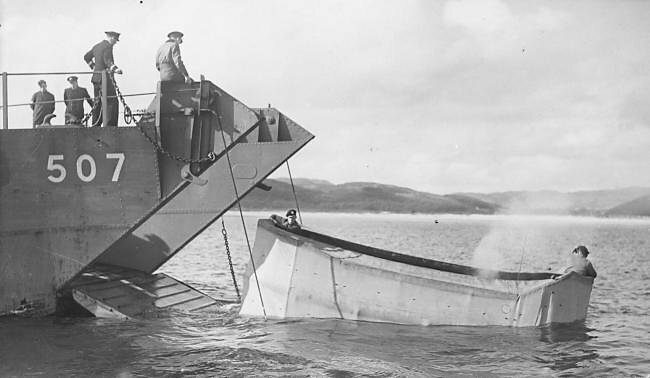 The Valentine DD was never used in combat – more for training in the run up to D-Day. The beach at Studland (south of Poole, Dorset, England) was judged to be similar to some of the proposed landing zones in Normandy. Unfortunately, during a training launch in Operation Smash in April 1944, watch by Eisenhower, Churchill and King George VI, the Valentines all sank, with a loss of 6 lives. Or “Command Post”, for artillery observation, equipped with a powerful radio kit. The gun was replaced by a dummy. For “Canal Defense Light”. These receive a new turret with a searchlight projector. Experimental only. Two prototypes were tested, the Valentine Scorpion II and the AMRA Mk.Ib, as well as a few Snake mine-exploders. Some sources stated some 150 used operationally. A genie turretless version equipped with 34 ft (10 m) long scissor class 30 bridge (30 tons). 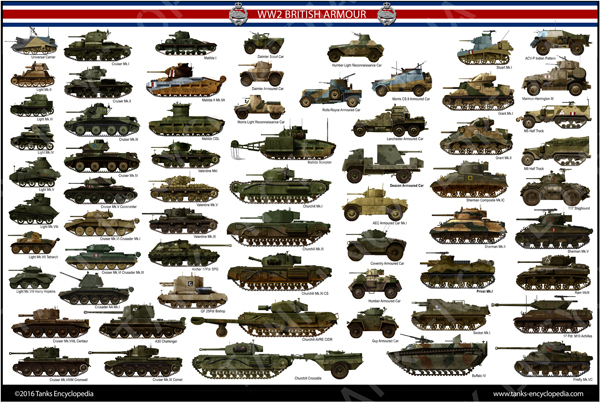 Around 60 produced, used by nearly all the Allies including the USSR. The Valentine 9.75 inch flame mortar experimental vehicle had its turret replaced by a fixed heavy mortar intended to fire 25 lb TNT incendiary phosphorus shells to demolish concrete emplacements. It was used for trials only by Petroleum Warfare Dept, Barton Stacey, 20 April 1944. The effective range was 400 yards (370 m). Maximum range 2,000 yards (1,800 m). One Valentine experiment had a fixed 6 pdr anti-tank mounting. This was dropped when the new 6-pdr turret finally appeared. 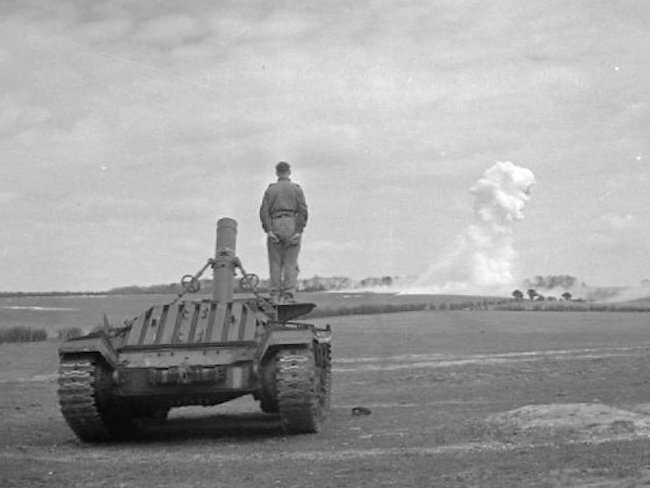 Two flamethrower version served as testbeds, in 1942, for the future Churchill Crocodile. Another tested, in 1944, a flame-mortar, firing TNT 25 lbs incendiary shells. The Burmark was a late ramp version scheduled for the Far East, but never produced. The Bishop was developed on the basis of the most sturdy, reliable and common platform available for desert warfare. The goal was to provide quick artillery deployment in the context of fast-moving desert operations in North Africa. The gun was the same standard 25 pdr howitzer (87.3 mm/3.44 in) in use by the Royal Artillery, protected by a large fixed enclosed shield. Only 149 units of this SPH were produced by the Birmingham Railway Carriage and Wagon Company, in 1942-43, as the Ordnance QF 25-pdr on Carrier Valentine Mk 1, but quickly replaced by the faster M7 Priest. This unusual vehicle was the first fully indigenous British tank-hunter of the war. It was developed around the excellent AT 17-pdr (76.2 mm/3 in), on a Valentine chassis, by Vickers-Armstrong. Due to the nature of the chassis and the gun, the SP 17 pdr, Valentine, Mk I, Archer was given a rearward-firing configuration. It was seen more like a mobile AT position, and not an active tank-hunter, contrary to the British/US Sherman Firefly. 655 units were delivered, in service in Italy, France and Germany in 1944-45. Some saw action in the Egyptian army during the war of 1956 around the Suez canal. Valentine Mark I, from the first delivered batch, in factory olive green livery, Great Britain, October 1940. Valentine Mk.I, in the standard homeland camouflage, in February 1941. Many of the 350 Mk.Is built were kept for training. Valentine II in Libya, May 1941. The Valentine came too late for Operation Compass against the Italians or the ensuing conquest of Libya. Valentine “Harry II” during Operation Crusader, November 1941. Valentine Mk.II, Operation Crusader, 1st Army Tank Brigade, December 1941. Valentine Mk.II HQ, 1st Army Tank Brigade. Valentine Mk.II, 40th RTR, Middle East, February 1940. Valentine Mk.II “Lana Turner”, late production version, with the new roadwheels and 2-Pdr Mk.V, from an unidentified unit, Tripoli, January 1943. Captured Valentine Mk.III, Libya, fall 1942. This version had a better Mk.V 2-pdr and a three-man turret. Valentine Mk.III in Tunisia, February 1943. Valentine IV, early production version, battle of Moscow, winter 1941/42. Valentine Mk.IV in Russian service, Northern Front, summer 1943. Russian Valentine IV on the Caucasus front, summer 1943. The usual livery was a lighter olive drab. Valentine Mk.V in Malta, fall 1942, with the famous spotted pattern applied to local AFVs. Valentine Mk.V (GCM diesel), Soviet Union, Guard Unit, Northern Front, 1943. New Zealand Mk.V CS (Close Support), 3rd Special Tank Squadron, Green Island, Pacific, February 1944. A Canadian-built Valentine Mk.VI, early type (1942), in Russian service. Canadian Valentine Mk.VI, Sussex, Great Britain, summer 1943. Valentine Mk.VII of the 6th Armoured Division, North Africa 1943. These were manufactured in Montreal and saw action in Tunisia and Italy, but most served for training with the Canadian Armoured Division, ulterior equipped with Shermans. Valentine Mk.VIII in Italy, Operation Baytown, VIIIth Army, Salerno, September 1943. The Valentine VIII was the first of the three upgunned late versions, equipped with the standard 6-pdr (57 mm/2.24 in) gun, far more effective against German tanks. But the first versions of the Mk.VIII turret was so cramped that the coaxial Besa machine gun was sacrificed. British Valentine Mk.VIII of the VIIIth Army, Italy, 1944. Valentine Mk.IX of the Northern Front, Poland, fall 1944, without front mudguards. Valentine IX of the Red Guards, Operation Bagration, June 1944. British Valentine Mark XI, a specially equipped version with the 75 mm OQF, only given to tank hunter unit commanders (Archer units), Holland, fall 1944. This is not an attempt by British tank designers to improve the speed of their armored vehicles or a gap jumping tank prototype. This was in fact a SADE mine clearing experiment using the blast from a jet engine to detonate anti-tank and anti-personnel mines. 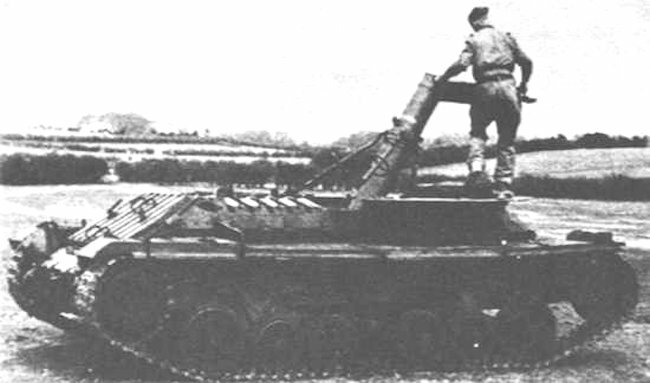 A Valentine tank chassis was used as the testing platform because the tank was obsolete at the time of the experiment. The Americans were also conducting the same research using M26 and M46 medium tanks. This is a photograph of the SADE experiment using a Valentine tank fitted with 26 rockets, 13 each side in four containers, to see if it was possible to make a tank jump over large gaps and minefields. It did not work and never entered production. A similar system was fitted to Universal Bren Gun carrier but with fatal results. The Carrier kept landing upside down during trials. I see you corrected the tag about the Valentine carrying a 17-pounder in a turret. I got into a rather heated enlargement with someone over it since this site was the only source I could find that didn’t say it was the Archer (which, of course, has no turret). The New Zealand received 255 Mk II, III and V of which the New Zealand 3rd Division used 34 in their 1944 Pacific campaign. They modified 9 Mk III to a MK IIICS (Close Support) standard by replacing the standard 2 pdr gun 3 inch (76.2 mm) howitzers from surplus Matilda Mk IV CS versions, and were instrumental in the Pacific Campaign until the end of the war. Other users of the Valentine included the Australians (mostly in North Africa), the Poles, and the Free French (a few) in Tunisia and Italy. Fix these and you will have a more accurate page. One of the profile captions needs a tweak as I think there’s been a typo. The 7th profile down reads “Valentine Mk.II, 40th RTR, Middle East, February 1940”. That date can’t be right and surely should say either 1941 or 1942.
what was the A- designation of the valentine? the a11 and a12 were the matildas but what was the valentine? by Government requirements were given the number. For the image marked: Valentine Mk.II, Operation Crusader, 1st Army Tank Brigade, December 1941. The current consensus is that the color blue on British desert tanks is a myth. The color should be grey. The worst aspects of the 2lbers performance,was the lack of HE rounds being made available.The same problems resurfaced with the 6 and 17 lbers as they did not get HE rounds until August 1944! Why this was so? There can be no technical reason because everyone else in the world managed! The British divided up the armament of their tanks, standard gun tanks were equipped with an anti tank gun with only AP ammunition. Close Support (CS)tanks were armed with low velocity howitzers (3-3.7 inch) which were issued HE shells but these were a minor percentage of their ammunition, the primary ammunition were smoke shells. This seems bizarre but there was an element of logic behind it. Based on their experience from the First World War the British had determined that HE shells were only effective against defended positions (ie bunkers) if they were of sufficiently large calibre, and that ultimately artillery no matter how large in calibre could not be solely relied upon to defeat a well entrenched enemy. The most effective way to defeat an entrenched position was to capture it via infantry assault, and as such the British focused their tactics on supporting and protecting the infantry during the attack. light rapid firing artillery such as the 25 pounder was intended to suppress the enemy (prevent them from manning the defences even if the shells weren’t big enough to destroy the bunkers) while infantry tanks were built with enough armour that they could accompany the infantry while still being proof against any anti tank weapons at the enemy entrenchment. Following that same logic the gun tanks were equipped with only AP rounds as their job was to engage enemy tanks that might be attempting to counter attack the infantry, while the CS tanks would lay smoke to allow the infantry to cross no-mans land and fire a small number of HE shells if needed to suppress the enemy. The towed Anti-tank guns were issued with HE shells because they were intended to act as anti tank guns in their main role but also as light artillery when needed (other nations also followed similar practice). The Australian and NewZealand tank units in the pacific made more prolific use of both 2 pounder and 3 inch HE rounds on their tanks, and actually manufactured their own HE rounds by reshaping 2 pounder AP cases to take 40mm Bofors HE shells as well as manufacturing canister rounds for both the 2 pounder and 3 inch guns. The vast majority of Canadian Valentines (all except 30 retained in Canada) went to the Soviet Union as lend lease. Valentines were not used in Sicily or Italy at all -possibly some bridgelayers were in Italy in 1945 and a few DD tanks with 7th Hussars. They were left in the Middle east for training and replaced by Shermans, as units moved on to Italy. Large numbers stayed in the Middle East, Iran and Iraq for training, eg Polish forces, some it seems, may have been passed on from there to the Soviet Union via the Iran route. 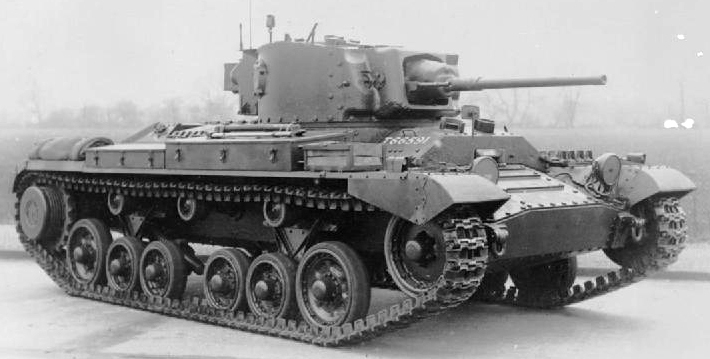 British Valentines Mk X and XI did not use cast front hulls – some of them had welded hulls which look similar, only Canadian tanks had cast hull fronts, but all marks had cast turret sections.